Coagulated with flowers from the Cardoon Thistle, which grows in the hills surrounding the dairies, this gives a distinct herbaceous flavour to the rich flowing curds, finishing with a wild, sharply sweet earthiness. Made by hand, the wheels are bathed in brine, then rubbed to give a smooth, almost waxy feel to the finished rind. Full-bodied dry red wines are an ideal match. An artisan-made mountain cheese coagulated with rennet extracted from the Cardoon plant (a wild thistle). This is not such a strange idea as the animals are grazing on pastures studded with wild herbs and flowers. The milk will separate into solid curds after about twenty minutes of exposure to the rennet, enough time for the plant to imbue its flavours – sharp, tangy, floral overtones give a delightful contrast to the smoothness of the curds. The rind is smooth and rubbed in oil before being wrapped in muslin to protect it from cracking, a practice we continue in our maturing rooms. 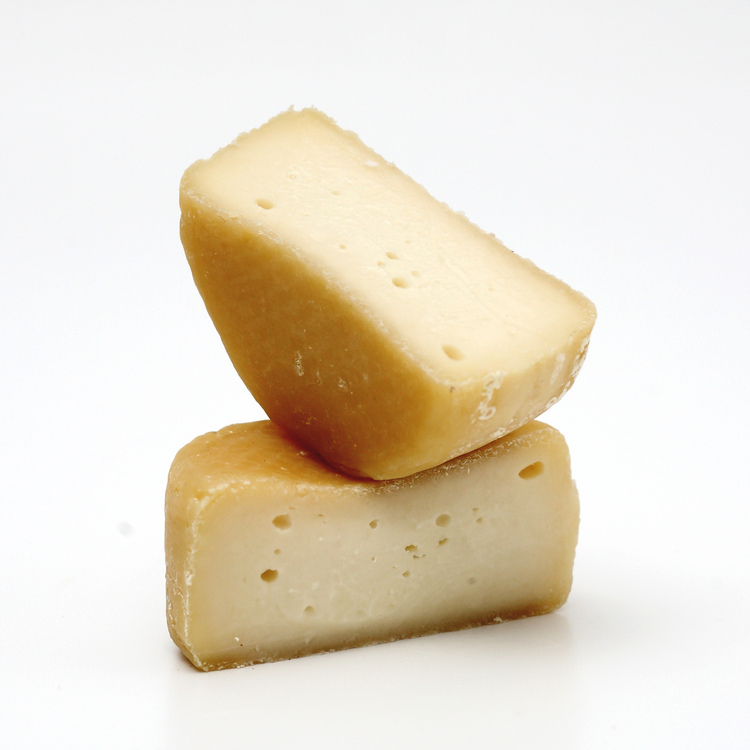 Eaten in its younger stages with a spoon, after removing the upper rind, this mature version, though melting on the palate, can be sliced, and is markedly sharper and zestier. Made by Fraser Norton & Rachel Yarrow from their own herd of pedigree Anglo Nubian goats and additional milk from another local herd. In the shape of a truncated pyramid with a nutty geotrichum rind. The pate has a mellow tangy taste with faint citrus notes. Aged for 21 days at the farm, we like to age it at least a further week in our fridges, tightening the rind & adding a nuttier edge to the flavours.